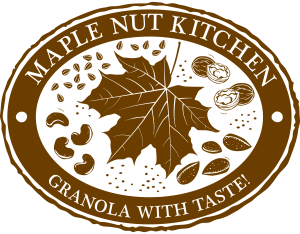 Maple Nut Kitchen LLC is a local specialty food company, which focuses on producing a line of fresh, gourmet gluten-free and vegan granola in Keene, NH. The business is owned by Vivian Cubilla-Lindblom, who has always dreamt of developing a specialty food product that’s both wholesome and delicious. In April of 2014, Vivian was able to purchase the business which was previously known as Courser Farm Kitchen. Through all the ups and the downs of the process, she has never regretted her decision. While Vivian has owned the company, she has constantly been growing her line of offerings and the response has been fantastic – customers love her products! Maple Nut Kitchen has 13 flavors available, including delicious grain free (Paleo) options such as Northern Berry Harvest and Eastern Apple Pecan. The product line also includes unique flavors such as Cashew Chai, Lavender Blueberry, Mocha Chip, Southern Cherry Almond, Sweet and Salty, Pumpkin Gingerbread, Maple Nut, and more! For a unique and satisfying granola treat, try some of this delicious Maple Nut Kitchen Granola today!